Remember, our NATO allies in Europe have a greater population than we do. They also have a GDP about the same as ours. And yet, they will not make a full effort to defend themselves. As if it was last century, they still think that the USA has to do the primary lifting. Heck, we keep having the same instinct. The United States needs more forces in Europe, Supreme Allied Commander Europe Gen. Curis Scaparrotti said during a hearing at the US House of Representatives Armed Services Committee on Thursday. "In terms of rotational versus permanent, I do believe we need more forces in Europe, I don’t think we are at the posture that I believe appropriate or required yet," Scaparrotti said. "And because of that, I think that there are some permanent forces that I would like to have." No, that is not the answer. The rest of NATO has to continue to strive to get better. Especially when most economies are strong and the Russians are expanding capabilities, there is no excuse. There is a lot on this topic NATO's Secretary General report for 2017. First, to be fair - things are getting better on the margins - but faster please. Allies have made significant progress in meeting these goals. After years of defence cuts, the trend over the last three years has been one of increased defence spending. 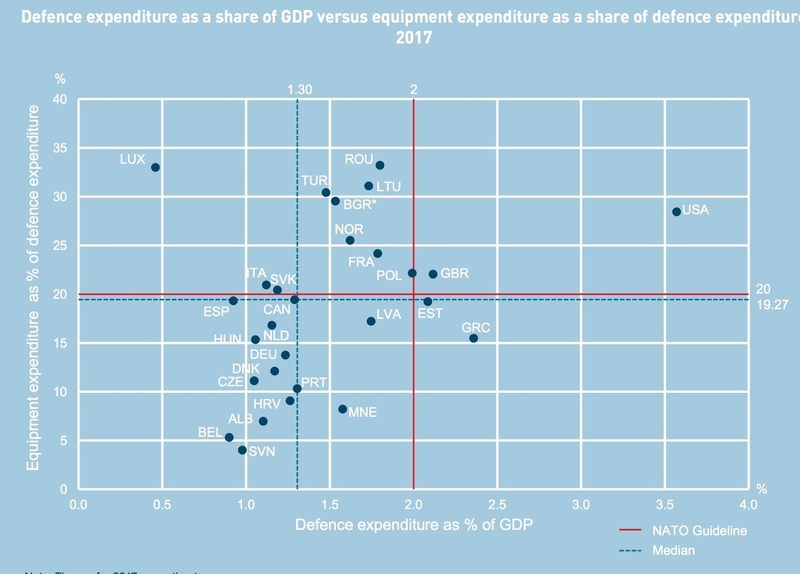 In 2017, the trend continued, with European Allies and Canada increasing their defence expenditure by almost 5%. Many Allies have put in place national plans to reach 2% by 2024 and are making progress towards that goal. 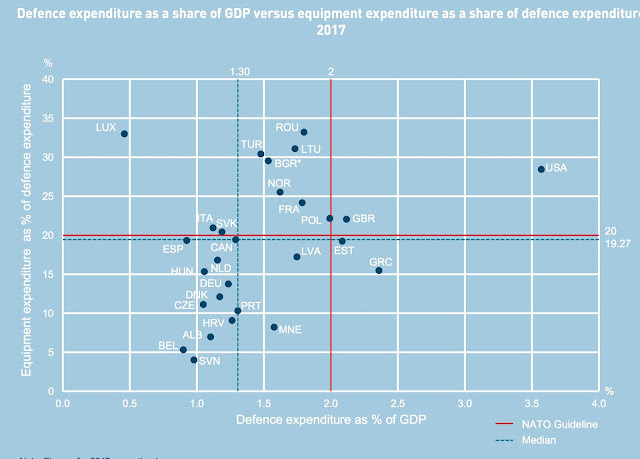 In real terms, defence spending among European Allies and Canada increased by 4.87% from 2016 to 2017, with an additional cumulative spending increase of USD 46 billion for the period from 2015 to 2017, above the 2014 level. 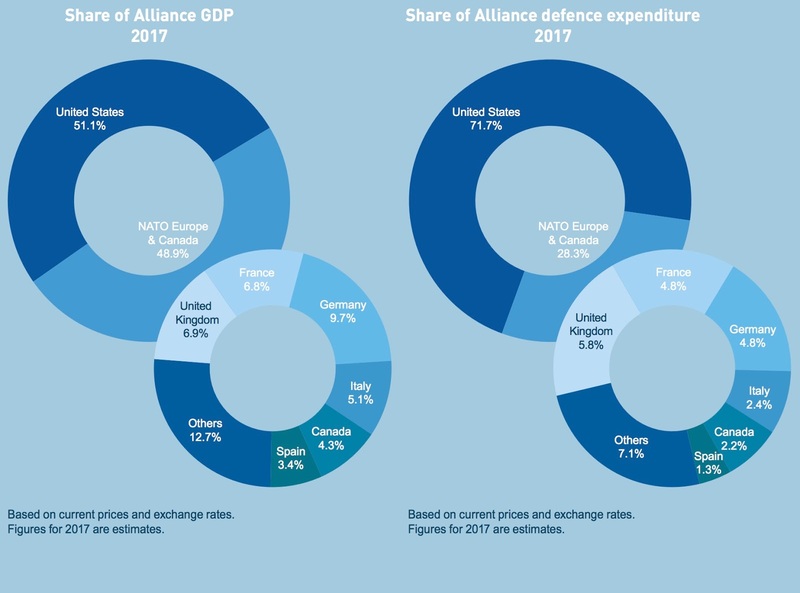 In 2017, the United States accounted for 51.1% of the Allies’ combined GDP and 71.7% of combined defence expenditure. At the same time, European Allies and Canada increased their spending, helping to redress the balance. In this report is another metric that brings you a level deeper. For old NATO hands, another of the problems is with how our allies spend their money. For some nations, their military is little more than a parade and garrison force. Sure, they have some numbers, but they have little to no functioning kit. We saw this in spades in AFG where planes of allied forces would arrive, but would go hat in hand for equipment. I like this chart a lot. If you are in the top-right grid - you are doing your share or more, and have something to fight with. If you are in the upper-left - you have something to bring to the fight, but you are not spending your fair share. The American tax payer does not need to spend money borrowed from its grandchildren to subsidize Europe's defense more than it already is. Keep spending until you reach 2% or more, then you can afford your own maneuver forces. No need to send more American brigades over there. If you need us for a fight, we'll be there - but you need to do your fair share now - in peace. Do that, and we probably won't have to come over by the hundreds of thousands ... again. The USAF Already Shifted to a Drone Future? Should Midshipmen Actively Become Political? Oh, it's International Women's Day?